..."I just zoned out a little bit because the atmosphere was a little iffy," Stacey said. "I couldn't focus." Somehow though, Stacey did just that. With 11 minutes left in the period, Stacey followed up a rebound for the first Maine goal of the game. Over the next seven minutes, she would continue her tear, scoring twice more and tying the game for Maine, a natural hat trick in the period alone. The period earned her Women's Hockey East Association Player of the Week honors, and will live on as one of the greatest feats in Alfond Arena history. "I don't even know. It was super exciting," she said. "Everyone was so happy, and I guess in shock kind of because we were down by three with 11 minutes left. And I guess all of the hard work, I don't know, it was a happy moment." 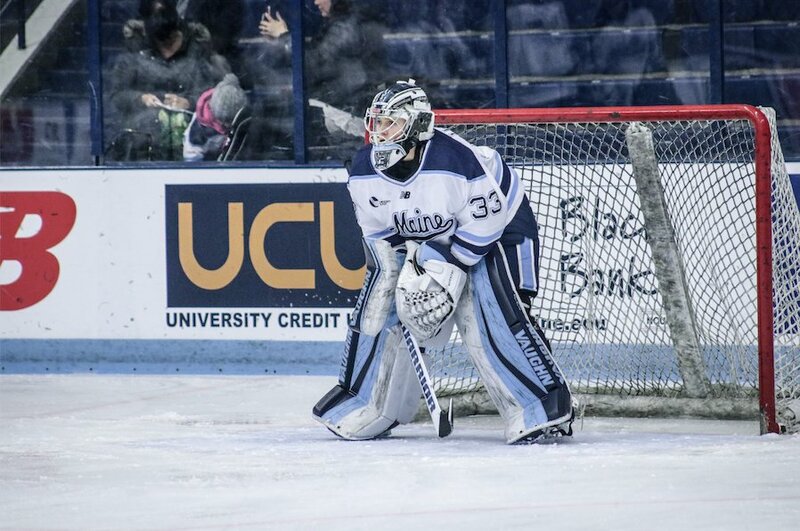 ORONO, Maine – After making an epic comeback from a three-goal deficit to Boston University in the decisive game three match of the best-of-three Hockey East quarterfinal series, the Black Bears triumphed in overtime, 4-3, thanks to a natural hat trick scored by Brooke Stacey. She netted all three goals within a seven minute span with under 12 minutes left in the match. Stacey even assisted Tereza Vanišová's game-winner 4:39 into overtime. The Maine women's hockey (19-13-5, 11-9-4 WHEA) team celebrated numerous firsts this past week. After defeating the Terriers in the first quarterfinal game, 3-2, the Black Bears achieved their first WHEA playoff win in program history while also breaking the record for the most wins in a season in Maine women's hockey history with 18, surpassing that record even further picking up their 19th win to move on to the Hockey East Semifinals taking on No-4 seeded Northeastern University (17-16-3, 11-11-2 WHEA). This was the Black Bears first ever postseason series victory while also facing the Terriers for the first time in playoffs. Maine hadn't come back from a three-goal deficit since the 2012 season. ORONO - As Maine women's hockey trudges towards its semifinal matchup with Northeastern, the Black Bears collected major Women's Hockey East honors in the process. Head coach Richard Reichenbach was named the conference's Coach of the Year, becoming the first in program history to ever take home such an award. He helped lead Maine to a 19-13-5 overall record this year, earning the Black Bears the No. 3 seed in the conference tournament. Joining Reichenbach in picking up awards are defender Alyson Matteau and forward Tereza Vanisova, both of whom were named to the conference's second team. Goaltender Carly Jackson was also an honorable mention. ...Head coach Richard Reichenbach was named New England Hockey Writers Division I Coach of the Year Wednesday, while star forward Tereza Vanišová was named a Division I All-Star. This comes on the heels of the program notching a record-setting 19 wins, and a trip to the Hockey East semifinals. "It's an enormous honor just for me, but I think coach of the year, I think program of the year, I think exceeding expectations," Reichenbach said Wednesday. :And I think it's something that our staff and our players can be proud of. And it's something that anytime you're recognized for something, whether you admit it or not, i think it feels good." VAUJANY, France – Two University of Maine women's ice hockey student-athletes were named to the final rosters of their respective countries ahead of the 2018 Division IA International Ice Hockey Federation (IIHF) Women's World Championship from April 8-14. Freshman Michelle Weis is representing Denmark while senior Victoria Hummel is skating for her native Austria. Weis, a forward, finished third on the team in points in the 2017-18 season, putting up nine goals and 12 assists for a total of 21. Her 21 points placed her seventh overall among rookies in Women's Hockey East. She notched three power-play goals and two game-winning goals on the year. Weis put together two, four-game point-streaks during the season. Hummel skated in 20 games as a senior, picking up an assist in Maine's win at Merrimack on Jan. 13. The forward skated in 101 games in her four years in Orono, collecting five goals, including two game-winners, and nine assists for 14 total points. Denmark is currently ranked 13th in the world while Austria is 10th. The two teams are set to meet on April 13 while both being round robin play for the Division IA title on April 8 in the Vaujany Arena. #BlackBearNation goalie Carly Jackson appeared in 35 games this season, going 17-12-5 to set a single-season program record for wins.